The French word "Terroir" refers to the set of environmental factors (soil, climate, etc.) and the farming practices employed to grow the grapes that give a wine its unique flavour and aroma. For the same reason, the taste and flavours of vegetables are strongly related to the natural environment of the farm and the farming approach employed. Unfortunately, most vegetables available in supermarkets, and even wet markets, are rather tasteless. These vegetables are probably grown (or rather, manufactured) in large commercial farms, which cannot afford to pay attention to "Terroir". In Japan, a farmer called Akinori Kimura managed to grow stunningly delicious apples using "natural cultivation" method that employs neither pesticides nor fertilizers, not even organic fertilizers such as compost or manure. He points out that the key is in the soil. In Hong Kong, about half a century ago, a farmer in a small village managed to grow a variety of Chinese cabbage which became famous because of its flavours and texture characteristic of the natural environment of the village. The variety was even given its own name "Hok Tau Pak Choi". Sadly, this variety is now extinct. Those Hok Tau Pak Choi seeds available for sale online must be fake. 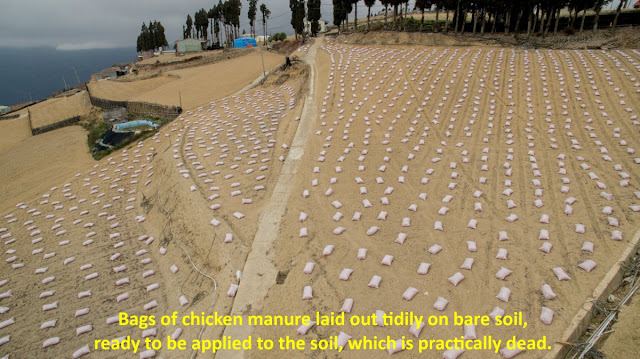 Soil is not just a medium to physically support a growing plant. In nature, soil is alive with countless numbers of living creatures in it - microbes, insects, worms, etc. Above the soil, there are butterflies, bees, dragonflies, birds and other small animals. All this biodiversity, both in and above the soil, enhances the cycling of nutrients, and this is how soil gets its fertility. 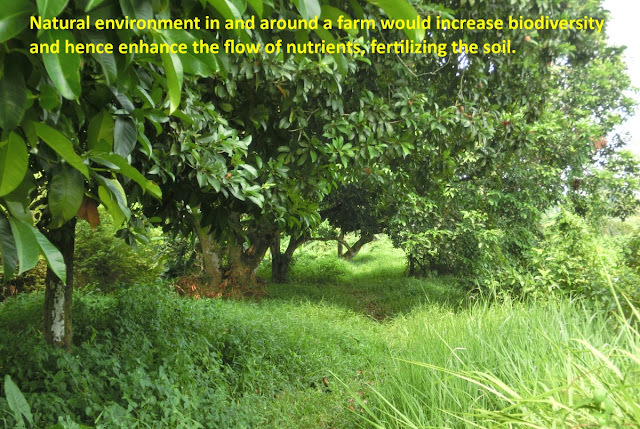 The vitality of soil comes from soil microbes. Presence of healthy microbe communities in the soil is key to healthy plant growth. The world of soil microbes is much more complex than we can think. What we do know is that a lot of the nutrients that a plant needs come from the soil microbes through symbiotic exchange. It is obvious that a good farmer should take care to look after the natural environment both in and around the farm, including the soil. If too much fertilizer, whether organic or chemical, is applied, the communities of soil microbes will be adversely affected, leading to unhealthy plant growth and further problems such as high nitrate content and less nutritious crops. Besides vitamins, proteins and minerals, there is another very important group of nutrients, called phytonutrients, found in fruits and vegetables. Science estimates that there exists more that 100 thousand phytonutrients, but scientists have only studied less that one tenth of them, such as lycopene, anthocyanidin and carotene. Although phytonutrients aren't essential for keeping you alive, they help prevent disease and keep your body working properly. Among the benefits of phytonutrients are antioxidant and anti-inflammatory activities, reducing cancer and heart disease risks. Phytonutrients are diverse in nature and many are responsible for the colours and flavours of the plant foods. That's probably why nutritionists ask us to take plant foods of a variety of colours. So, how are phytonutrients produced in plants? It is "terroir" again. The set of natural environmental factors - climate, soil, microbes, insects and animals, provides the conditions and ingredients for a plant to produce a complete set of phytonutrients in it. Human health comes from soil health. While it is difficult for large commercial factory farms to produce crops rich in flavours and phytonutrients, there are examples of successful small natural farms that use natural farming methods to produce healthy and nutritious foods for the communities, and are financially sustainable too. One such farm is Le Bec Hellouin Farm in France. Land scarcity in Singapore is actually an advantage in establishing small natural farms. In every district, there are already amenities and facilities like community centres, parks, hawker centres, multiple-storey carparks, clinics, post offices etc. How about farms that produce food for the residents - the next level of the already successful Community in Bloom Initiatives by NParks. Not just gardens, but small farms of 0.1 to 0.5 hectares that seriously grow food for communities while looking after the environment. In this way, consumers (residents) are close to the farms and they can see the source of their food. The Tengah Forest Town that our government is planning has a huge potential to establish a few bigger natural farms too.